Did you get a chance to play the Super Mario 64 HD remake posted on the interwebs several days ago? The remake was built by Erik Roystan Ross, a computer science student who has been documenting some of his work with the Unity engine on his personal blog. 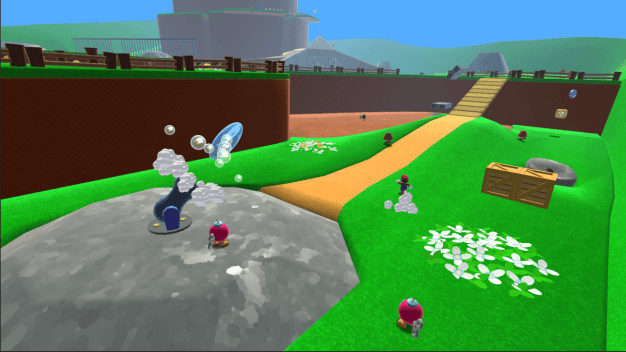 It was a beautiful recreation of the first level of Super Mario 64 that you could play in your browser with the Unity plugin. Ross was also offering a free download of the level as well. While it was missing some key components, like the boss battle, Koopa shell riding, and Wing Cap, it had all the nuances of the classic Bomb-Omb Battlefield. However, Nintendo’s legal team has gotten word of the remake and issued a copyright infringement notice to Ross. This means that both the browser- and download-based versions have been removed. Ross states on his blog that he really didn’t think that the project would become so popular, and “was hoping it would function primarily as a educational tool and a novelty”. According to Eurogamer.net, Nintendo’s notice mentions a copyright breach for “Nintendo’s Super Mario 64 video game (U.S. Copyright Reg. No. PA0000788138), including but not limited to the audiovisual work, computer program, music, and fictional character depictions”. The article also mentions that Ross had ripped several meshes from Super Mario Galaxy, but had done the art and animations himself. You can check out what the Super Mario 64 HD remake looked like in the YouTube video below.